Goldfish in ponds usually rely on the spring weather to tell them when to spawn. When the temperatures rise, the fish begin getting interested in spawning. Typically, it takes more males than females to complete spawning, since an average female goldfish can lay thousands of eggs all at once. Not all of the eggs will be fertilized, so the more males that are available, the better the chances that most of the eggs will be fertilized. When temperatures rise, and spawning season begins, the fish will appear after the thaw, full of algae they've nibbled all winter. Algae has beneficial nutrients and strengthens goldfish, preparing them for the rigors of spawning. The actual spawning takes a few seconds, but the fish will spend several days working up to it, with males chasing females frenetically. When serious spawning begins, then the female releases her eggs. The male releases his milt (sperm) over the eggs, completing the process. The eggs, once released and fertilized, will stick to the pond's edges, plants and rocks. The stickiness ensures that the eggs get covered by the male's milt, and are somewhat protected by sheer numbers. Some of the unhatched eggs will be eaten by fish or snails. If the eggs were just floating around untethered, they could end up inside a filter, get caught inside a fountain, or catch the attention of a hungry fish and become lunch. After the eggs have attached, they will hatch within a short time. If the water is warm, the eggs will hatch a couple days after being laid. If the water is still cold, the eggs may sit for a while, developing more slowly. Most of the eggs will hatch 2 to 7 days after laying. An interval much longer than that probably is due to unfertilized eggs. Unfertilized eggs are eaten by the newly hatched fry. Goldfish parents don't take care of the hatching babies. If the young fry don't hide after hatching, they become lunch for the large fish. Providing the fry with plenty of plants to hide in helps give them a chance. 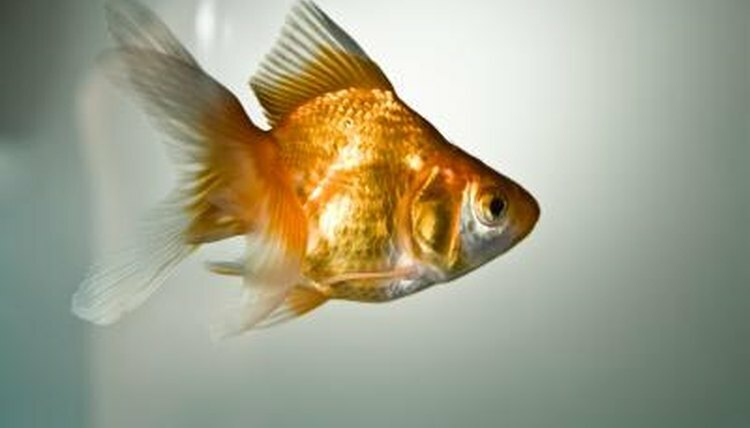 Goldfish are self-sufficient from the moment they hatch and must find their own way in the aquatic world. The fry eat algae, which gives them a good start, and also nibble leftover fish food the adults miss. Goldfish Care: How Many Eggs Does a Female Goldfish Lay During Breeding Season? Goldfish Care: How Long Does it Take for Goldfish Eggs to Hatch?